The United Arab Emirates (UAE) has been quite busy the last number of years growing their economy literally from the ground up. For example to attract tourists, they have built the magnificent Burj Al Arab, a luxury hotel located in Dubai, United Arab Emirates. It is the fourth tallest hotel in the world stands at 321 m (1,053 ft) and sits on an artificial island. 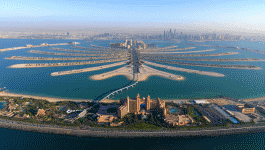 Their man-made Palm Islands are a sight to behold for the many visitors that come to the region. The UAE’s Burj Khalifa is the tallest skyscraper in the world registering a height of 2717 feet and recognized as one the world’s most elite structures. They already have plans to build the a whole new city that will house the largest shipping center in the world. It seems that everything the UAE is building these days is the world’s biggest and best or close to it. Why not, if you have the money to do it? Although the UAE may have a lot of money, their choice to invest it in this manner is very smart indeed, especially from an economic standpoint. Their approach has not only created opportunities for the UAE, but also resulted in appealing investment opportunities for the international investment community, as well. For the longest time, the UAE’s economy depended heavily on oil, and it still does to a great extent. Their leaders’ vision to build a strong more diverse domestic economy featuring some of the world’s latest and greatest engineering technologies, is what sets the nation apart from other countries that are building their own economies with very different visions and certainly less appealing results. These mega-projects also have created many thousands of local jobs that have in turn helped fuel their economy while generating prosperity for it’s people. As a result of their manufacturing base being increased leading to more non-oil exports and a rise in imports to feed their growing consumer base, the UAE also had to look at doing something to upgrade their ports as well. Abu Dhabi's Khalifa Port Container Terminal, was just opened late last year and is already expected to surpass their first-year projections by far. The state-of-the-art facility continues to get very positive reviews and is functioning almost flawlessly so far. It should also be mentioned that the Jebel Ali Port located near Dubai, is the world's largest man-made harbor and the largest container port between Rotterdam and Singapore. There is an old expression used often in the West, "go big or go home.” When applying it the UAE, their home is already filled with big things with the promise of more big things to come in the future.